The details have been finalized and a date has been chosen for the first Love Your Camera session, a teach and shoot workshop designed to help people with DSLR cameras or Point & Shoots learn to use their cameras to their fullest potential! I want this session to be fun, personal and beneficial, so there's a limit on how many spots are available. I hope that this is the first of several sessions. 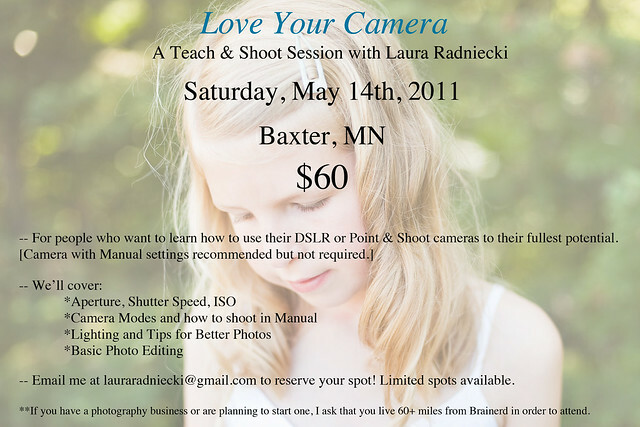 If you would like to attend, send an email to lauraradniecki@gmail.com. The spots will be filled on a first come, first serve basis. I'm very excited and a bit nervous to be finally moving ahead with what has just been an idea in my head until now. This session will be along the lines of a community-ed type class, very relaxed and perfect for asking questions. No pressure, just a lot of fun!